Today, Susan Leigh Noble is releasing her newest novel, Blood Bond, and to help announce it here's a little blog post. Was there this one moment that made you realize you wanted to be an author? I am not sure there was a single moment where I decided I wanted to be an author. I have always liked to write, and I majored in journalism while in college. It was there that I developed the idea for my first novel, though it would be many years before I got something written worth publishing. Dragons are amazing creatures and so many of us are fans of them. 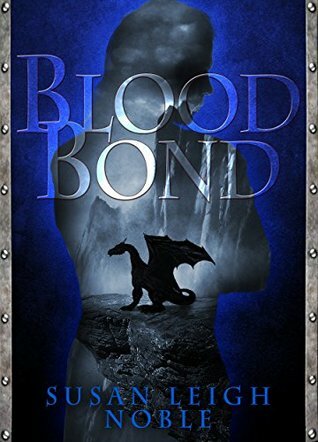 They’re included in not only your new book, Blood Bond, but also your previous series, The Elemental Trilogy. What about dragons sparks such an interest to you that you’ve written so many books including them? Were you always fond of them? Dragons are so powerful and full of possibilities as characters. They can make interesting villains, but that is a boring stereotype. I tend to use them as intelligent allies to my protagonists. Every full-length book I’ve written has included at least one dragon. I don’t know when or where my love for dragons came from, but I would like to note that I like dragons as magnificent-looking creatures like the ones depicted by M. Pena’s Windstone dragons (I have quite a collection of these) or the ones drawn by Peter Pracownik. There are so many fantasy books out there about war, magical bonds and that one character who didn’t want to be a hero but was put in that position. What makes Blood Bond stand out among the crowd? Well, for one, it has a talking dragon. But really, the story is not just about a reluctant hero (Soren). It is a story about the relationship between Soren and the dragon Dex. Think of it as a buddy combo where one part of that dynamic is a telepathic dragon. What is one thing the readers should know about your hero? He never thinks of himself as a hero even when he does daring things. Even at the end of the book, Soren would scoff at the idea of being a hero (or a leader). What is the most challenging part about being a writer? What is your favorite part? I think one of the most challenging things sometimes is just the ability to stick with a project. I love writing but there are so many other things going on to draw your attention, and writing and publishing a book is a long process. I don’t think many writers realize this which is why many new authors may only publish one book. The best thing is hearing from readers who enjoyed your book. I love the fan mail! What does a typical writing day look like to you? I don’t think I have a typical writing day since I don’t write full time. I do a lot of volunteering at my kids’ schools, and I handle the financial side of my husband’s law firm so sometimes writing takes a backseat to everything else. I find that I get the most writing done in the morning. Sometimes if I can’t sleep, I get up early and write or at least try to get writing done in the morning before other things try to pull me away. Is there anything specific you do to overcome writers block? If I sit down at the computer and writing just won’t come, I usually go back and read what I have already written. Sometimes just seeing something that was working or reconnecting with the characters can spark the imagination and get the writing juices flowing again. Who is your favorite book boyfriend? Hmm…that’s a tough one. I don’t like picking favorites. But let’s go with a classic – Ponyboy Curtis from The Outsiders by S.E. Hinton. There are many great authors out there that have inspired me to write, but I have to say my biggest inspiration is my husband. He was the one who encouraged me to self-publish. His faith in my writing and his advice has gotten me to where I am today. I am working on an idea for a follow-up trilogy for The Elemental trilogy. I have had quite a few fans write in that they want to know what happens to the main characters Lina and Val. I have a few ideas but need to make sure I have a strong enough plot to survive three full-length books. Let me know if any of you check out Blood Bond and what you think!